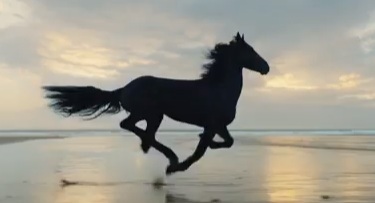 Lloyds Bank has released a new advert, featuring the iconic black horse and a famous music track. The 60-second spot, titled “By Your Side”, aims to highlight that the bank has always been by its customers’ side “through the bad times and the good”, as the song playing in the background, a dramatic cover of “Praise You” (originally by Fatboy Slim, from his 1998 album “You’ve Come a Long Way, Baby”), performed by Hannah Grace, is saying. The black horse, introduced by Lloyds in 2015, when the bank celebrated its 250th Anniversary, is shown running across the fields, where a young girl is helping her grandfather to protect the hay from the rain, passing by a ship, an abandoned building, a group of people at a funeral (most probably of a soldier who died in a war), on a desert road, through a forest, through a neighborhood where a little girl is watching through the window and a mother breastfeeds her newborn baby, through a car factory, through a small town and, eventually, on a beach. “Britain has seen great change through the past 250 years. And through it all, we have been and always will be by your side”, says the voiceover in the advert, which ends with the onscreen line “By your side for over 250 years”.